In this pioneering, practical book, Daniel J. Siegel, neuropsychiatrist and autho Your toddler throws a tantrum in the middle of a store. Your preschooler refuses to get dressed. Your fifth-grader sulks on the bench instead of playing on the field. Do children conspire to make their parents’ lives endlessly challenging? No—it’s just their developing brain calling the shots! • Move It or Lose It: Use physical activities to shift your child’s emotional state. To ask other readers questions about The Whole-Brain Child, please sign up. What age do I recommend my child be when I read this book? I have a one year old. In a lot of the parenting books I have read, I have found that the majority of the book is a waste of my time because it doesn't apply to us yet, so I find myself saying, "I hope I remember this advice in ___ years" or "I should re-read this book in __ years." Dan Siegel and Tina Payne Bryson’s “The Whole Brain Child” fails to deliver on the titular promise of “revolutionary” parenting strategies to “truly help your kids be happier, healthier, and more fully themselves”; it does, however, provide innovative and effective explanations, packaging, and delivery of many tried-and-true parenting techniques that turn out to be neuroscientifically based. 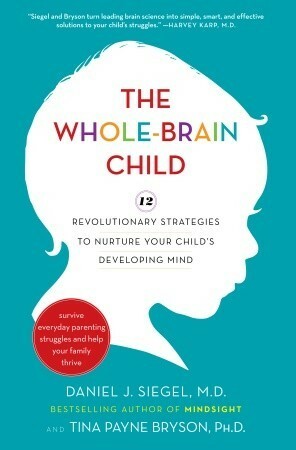 The first four chapters are the love child of the Johns - Medina’s “Brain Rules for Baby” and Gottman’s “R Dan Siegel and Tina Payne Bryson’s “The Whole Brain Child” fails to deliver on the titular promise of “revolutionary” parenting strategies to “truly help your kids be happier, healthier, and more fully themselves”; it does, however, provide innovative and effective explanations, packaging, and delivery of many tried-and-true parenting techniques that turn out to be neuroscientifically based. So far all we’ve got is clever packaging and some fun analogies for pretty standard knowledge regarding keeping kids calm. The true deliciousness of what Siegel and Bryson bring to the table is a self-awareness that is two-fold, one not unique and the other truly so. First, like Medina, the authors apply their knowledge of the brain to their own project, creating a structure that maximizes retention and usefulness, including the descriptive “strategies” as chapter sub-headings, a “refrigerator sheet” that summarizes a few details under each strategy, an “ages and stages” chart that emphasizes different applications for children of different ages, and acronyms (e.g., “before you over-analyze the situation, HALT and check the basics: is your little [one] simply hungry, angry, lonely, or tired?”). Second, and most thrilling, the authors provide graphics and suggestions for talking to kids about the way their brains and bodies work, giving children an opportunity to consciously take part in regulation of their own emotions and behavior. For the past few years, I’ve tried to provide my toddler with ownership over her well-being, telling her about some of the parenting techniques I read about, giving her a head’s up that I intend to use them, and then chatting about their effectiveness. But I’ve never read about doing this in a parenting book, and certainly haven’t heard anyone suggest starting with brain science. At their suggestion I said to my toddler, “You know how when you’re happy, your brain puts a smile on your face? Well, the same thing works backwards a little. If you smile for a while, even if you’re sad, you’ll start to feel a bit better.” And that’s just the beginning. Pretty freaking cool, guys. I'd have given this book five stars if the writing were a bit more engaging; as it is, though the material is often fascinating and incredibly relevant (I've a 28-month old toddler at home! ), I found the reading a bit of a slog at times. What Siegel has done here is, based upon cutting-edge neuro-science, boiled down the info relevant for parenting into 12 strategies to help you guide greater brain integration in your children, from birth through about 12-years old. The kinds of things we're talki I'd have given this book five stars if the writing were a bit more engaging; as it is, though the material is often fascinating and incredibly relevant (I've a 28-month old toddler at home! ), I found the reading a bit of a slog at times. The kinds of things we're talking about here are simple strategies to utilize daily experience to help integrate the right and left hemispheres of the brain, the upper and lower structures of the brain, memory, the various aspects of personality and self and other. For instance: the two strategies for integrating right and left brain are 1) connect and redirect and 2) name it to tame it. For infants and toddlers, the suggestion for the former is to mirror feelings your child is experiencing and use nonverbals to show you understand. Once you've connected, focus an a more appropriate activity. For the latter, you acknowledge and name the feeling ("You look sad; that hurt didn't it?") and then offer a narrative of the experience. At this age, you must be the narrator. By the time a child is a pre-schooler, and more verbal, these same strategies develop as well, with the first strategy simply listening and repeating back what you've heard; then after the connection is made, directing toward problem solving and more appropriate responses. With the second strategy, he suggests you begin the narrative of what happened and then follow your child's lead, with you filling in where necessary. By the time the child is 12, in connect and redirect, he suggests you listen and reflect back what you hear your child is saying about how they are feeling, being careful not to condescend or talk down to her. AFter the connecting, redirecting is now directed to planning and perhaps even some discipline. I picked the most obvious of the examples, but suffice to say that the others offer some really good, solid, practices that would go a long way to make parenting a truly mindfulness-based experience. As he says in the conclusion, by parenting with this kind of attention and intention, we're impacting not just their lives, but the lives of all those they will relate with. This goes beyond the impact they will have on their children and grandchildren. As Bruce Hood makes clear in his The Self Illusion, our brains are not atomistic monads but rather social structures; self and family and community are connected neurologically. I liked this book and appreciated the clear explanations of some brain science concepts (though I don't know whether it is all strictly accurate - for example, I keep hearing that the "left brain, right brain" thing is somewhat of a fiction). The book had a few really useful tools which I liked (for example, the wheel of awareness, and "move it or lose it"). It was well laid out, the cartoons and illustrations were helpful, and I really liked the "refrigerator sheets." As a parent and a therapis I liked this book and appreciated the clear explanations of some brain science concepts (though I don't know whether it is all strictly accurate - for example, I keep hearing that the "left brain, right brain" thing is somewhat of a fiction). The book had a few really useful tools which I liked (for example, the wheel of awareness, and "move it or lose it"). It was well laid out, the cartoons and illustrations were helpful, and I really liked the "refrigerator sheets." As a parent and a therapist, I'll recommend this book to other people who want to teach their children social-emotional skills and figure out some helpful ways to respond to their children's emotions. Despite all that, I didn't think the strategies were revolutionary. I read an article about therapy recently commenting that all the research on "brain science" doesn't necessarily tell you what INTERVENTION is needed to help someone. Conversely, you can know what intervention is needed without understanding the brain science. Though I didn't completely agree with the article, I was reminded of it while reading this book. For example, I liked the "upstairs brain, downstairs brain" metaphor but ultimately isn't this just another way to say that you need to help your kid get out of the stuck tantrum-y place to where they can think reasonably? Overall, their suggestions for intervention are fine (though they won't work all the time... but then what will? ), but I'm not sure that knowing the brain science changes anything about this. I am pleased to add this to my very, very small pile of approved discipline books. 4) it's fairly easy to implement...once you've made the paradigm shift, that is. 5) it honors and respects children and reminds parents t I am pleased to add this to my very, very small pile of approved discipline books. 5) it honors and respects children and reminds parents that many of the "behavioral problems" we see are, in fact, totally normal developmental phases that children simply need additional support and nuturing to manage through. I've been reading about brain development in infants and children since my daughter was born 6 years ago. Understanding how the science of the brain interacts with the behavior of or the ability of a child to learn has led to my having more empathy for and understanding of my child. Many times we have expectations for our children that they can't meet, because their brains haven't been wired to do so yet. In addition, variations in parenting techniques work differently across the various age gro I've been reading about brain development in infants and children since my daughter was born 6 years ago. Understanding how the science of the brain interacts with the behavior of or the ability of a child to learn has led to my having more empathy for and understanding of my child. Many times we have expectations for our children that they can't meet, because their brains haven't been wired to do so yet. In addition, variations in parenting techniques work differently across the various age groups of children based upon their development. This book is very helpful in helping parents to understand how to help their children integrate the various parts of their brain so that as they grow older they will have the right tools to help them be healthy and happy individuals. The author goes through the different parts of the brain and the states that they are in throughout each stage of a child's development. He then explains how parents can help to integrate parts of the brain via the use of various techniques. There are 12 techniques described in the book, and Siegel does a nice job of providing examples of how to use the techniques. Like any other parenting technique, parents may have to be creative to some extent, but I thought that it was great how Siegel lays out certain questions that parents can act simply to get their kids using a different part of their brain to address the problem. I also was pleasantly surprised to find that some of the techniques are being used at my daughter's school. She is learning mindfulness and mindful breathing at school. Siegel has a whole chapter dedicated to it the book. Its focus is on how to train the brain to calm itself down and get back to a place where the logical side of the brain takes over from the emotional one. Some of these techniques work for adults, too. This book isn't about how to make your kids behave or how to turn your kid into a genius. Instead, its focus on how a "whole brain" that is fully integrated will help a child grow into a more functional adult. I also liked that Siegel didn't make me feel that these are things that we need to be working on with our children ad nauseum. Having fun and relaxing with your kids are important, too. This little parenting book is basically about how to teach children emotional intelligence--how to get them to recognize their own emotions, that emotions are temporary, and how to develop sympathy, among other things. Often when I interact with an upset child, I take the "dismiss and deny" strategy of telling them it's okay and that whatever they're upset about isn't that bad. Using this book's method, it's better to first acknowledge the child's emotion, like saying "you look sad! Is it becaus This little parenting book is basically about how to teach children emotional intelligence--how to get them to recognize their own emotions, that emotions are temporary, and how to develop sympathy, among other things. Often when I interact with an upset child, I take the "dismiss and deny" strategy of telling them it's okay and that whatever they're upset about isn't that bad. Using this book's method, it's better to first acknowledge the child's emotion, like saying "you look sad! Is it because Cariton won't share that toy with you?" to get them talking about why they feel the way they do, and to acknowledge their current emotional state, and then redirect their attention to something not-sad. I liked the concise writing and the comic book examples, and I especially liked the chart in the back that has suggestions for the different age groups. I felt disappointed in how dumbed down the neuroscience felt though. One of the back-of-book blurbs described it as "erudite" and offering a "science focus" which is completely misleading. This book is directed at parents who never took neuroscience in college; it doesn't address picky details like which study said that and what their sample size was. In particular the reuse of the "wiring/rewiring" bothered me. They also cited a study on the brain development of vilonists to show that playing the violin can change your brain, when in reality that study also looked at people who learned to play the violin later in life and how it doesn't change your brain's physicality as much later (so I felt that they cited it incorrectly). I also didn't like the inclusion of the buzzword "mindsight" when it seemed like "sympathy" would have worked perfectly well instead. I must say i am surprised to see so many good ratings. On the other hand it is the reason why I read it. First things first: I'm a dad with a 2 years old child and probably share every moms and dads usual issues and questions. By the way, we split everything that involves our child at home, meaning I do half of ALL. At first this book looked very promising. And then....I realised it has 2 sides. On the one hand, at the end of every chapter, there is a real life problem with the real life actions pa I must say i am surprised to see so many good ratings. On the other hand it is the reason why I read it. On the one hand, at the end of every chapter, there is a real life problem with the real life actions parent should try to take. That's the good part. The bad part is that the whole rest of the book, ie 80% , is the pseudo-scientific explanation based on a over-simplistic model of the brain that the authors seem to be so proud of that they need to explain it to us in detail. I'm a dad, I'd like to spend as much time possible with my son, so I'd appreciate books for parents that stick to what parents need to know, plus a bit of theory (thats fine), but i'd appreciate the professional bshit to be left at the conference rooms where it belongs, eventually on TV. Easy to digest info on neuroplasticity....providing tools to help teach: 1)how to use both your logic and emotional sides of your brain more cohesively to make more balanced choices, and 2)how to get "unstuck" and be more flexible with your thoughts. Great for parents and teachers alike to help teach kids they can learn to influence their environment rather than be influenced BY it. Sadece çocuğum ve ebeveyn olmak ile ilgili degil, kendi çocukluğum, duygularım ve farkındalığım ile ilgili aydınlanma yaşadığım bir kitaptı. Beynime ve çocuğumun beynine bambaşka bir açıdan bakmayı, ona farklı düşünebilmeyi öğretebilmenin mümkün olduğunu keşfetmek beni inanılmaz heyecanlandırdı. Bu tarz kitapları çok sevdiğimi söyleyemem ama şu ana kadar o ya da bu sebeple okuduklarıma şöyle bir baktığımda nacizane bir genelleme olarak şunu söyleyebilirim ki kitapların ilk yarısı rahat okunuyor, çoğu zaman öğretici de oluyor. Geri kalan kısmı ise tam bir: Niye bitmiyor bu kitap? Bu da onlardan bir tanesi oldu benim için. If you are a parent, teacher or other person who works with children, I would commend this book to you. By understanding how the brain works, you can survive tough moments and teach children to thrive. The Whole-Brain Child explains both how and why. SIFT: sensation, image, If you are a parent, teacher or other person who works with children, I would commend this book to you. By understanding how the brain works, you can survive tough moments and teach children to thrive. The Whole-Brain Child explains both how and why. Each strategy is explained both scientifically and practically. There are examples and a particularly helpful appendix chart that give examples of how to use these strategies with various ages. The book also includes cartoons to share these concepts with your kids. This isn't voodoo science you use on your children to control them, these are strategies you share with them so they can have greater control over their own emotions. I enjoyed this and tore through it pretty quickly. The only thing that annoyed me is the term "mindsight" ... It seems like there's already a term for what's being described: mindfulness. "Mindsight" sounds like a marketing term was being used where it wasn't necessary (maybe I'd feel differently had I also read Mindsight the book). Or maybe mindfulness isn't as common a term as I think and it helps people get the idea. Especially kids. Anyway, it seemed like there were good tips in here, for kid I enjoyed this and tore through it pretty quickly. The only thing that annoyed me is the term "mindsight" ... It seems like there's already a term for what's being described: mindfulness. "Mindsight" sounds like a marketing term was being used where it wasn't necessary (maybe I'd feel differently had I also read Mindsight the book). Or maybe mindfulness isn't as common a term as I think and it helps people get the idea. Especially kids. The useful content of this book could be put on a post-card. 99.5% of the book, however, is full of stories bragging about how awesome the authors are. For those readers expecting neuroscience: Walk away. You'll be disappointed. The authors mostly ignore neuroscience, and when they do mention it, they talk down to readers as if we are toddlers as well. An excellent read on how integration of the brain plays into a child's development. The idea of integration as a whole was new to me; I was familiar with certain elements of how the brain functions for wholeness, but not how the interplay of all the bits equals mental health. Unsurprisingly, the book falls short of whole-person development because it reduces the Person to simply material being. It shelves "morality" in the category of brain function, albiet a desired function. How does the brain An excellent read on how integration of the brain plays into a child's development. The idea of integration as a whole was new to me; I was familiar with certain elements of how the brain functions for wholeness, but not how the interplay of all the bits equals mental health. Unsurprisingly, the book falls short of whole-person development because it reduces the Person to simply material being. It shelves "morality" in the category of brain function, albiet a desired function. How does the brain structure interplay with the soul? A question for different book. But can you speak of full integration and complete mental health if you haven't addressed that? Dan Siegel is a luminary in the field of psychology, and is one of the leaders in the neuroscience and neurobiology movement in our field. I have heard him speak and am familiar with his work, and I think its important and cutting edge. I have always been interested in the neuroplasticity and the impact and intwine of neuroscience in our relationships. I think its an important aspect of what happens in both our healing and our relating. This book is very light on the science, and is meant as a si Dan Siegel is a luminary in the field of psychology, and is one of the leaders in the neuroscience and neurobiology movement in our field. I have heard him speak and am familiar with his work, and I think its important and cutting edge. I have always been interested in the neuroplasticity and the impact and intwine of neuroscience in our relationships. I think its an important aspect of what happens in both our healing and our relating. This book is very light on the science, and is meant as a simplification of the concepts toward what parents of young children can use in their children's development - and how to use strategies toward fostering emotional development. I found myself having a similar reaction to other parenting tomes, like the Mazlich and Faber series, How to Talk So Your Kids Will Listen, and How to Listen When Your Children Talk, and their other related books. It felt to me just like good parenting (and good therapy). The precepts held within, would be endemic to any good parent, or good therapist. It sounded a lot like good therapy. Dan Siegel's book felt the same, and I found myself thinking about how therapy works and happens on a basic level. I began to wonder who the intended audience might be, as this was more of a lay paperback, rather than his other more detailed and professional books. But I wondered. The folks that need these basic skills in parenting and attunement. Would they be likely to pick up this book? Its not that the strategies felt wrong, they just felt basic to me. For example, #11 is to have fun with your family, as that is a neuronal wiring experience of what you want to build in your child's brain experience. Lately, when I read these parenting books, I am wondering how to relate them to the challenges of teens and young teens, and the links and connections to me weren't so evident. Other parenting experts have expanded their early childhood thinking toward teen raising. For example, the author of Blessings of a Skinned Knee, later came out with its sequel, the Blessings of a B Minus, using the precepts for teens. I couldn't find the links as easily with this work. But I did try to think about the messages we send to teens. Lately, I am saying to my children (about emotional integration) that one of the most important life lessons we can learn, is to be responsible for our own emotions, and to try to get a hold of them. That no matter what is going on around us, we can be responsible for ourselves and our reactions. And to think about how we best want to respond to situations. That we can also choose how we deal with a situation, and manage our emotions. This is something I think we are working on in the house, and is the teen/adult version of what we hope to exemplify and teach to our young children. But I wish the examples dealt more with the teen brain, and had stories related to this age group and our specific socio-cultural challenges. So even though I have a seven year old, it felt basic for me, for my family, and for my level of professional knowledge and expertise. But like with my reaction to the Faber Mazlisch books, (Its just good parenting, good therapy), I also realized that I have a particular advantage and knowledge base. I happen to think the Faber Mazlisch books are great examples of teaching one's children's this kind of emotional integration and resultant behavior management. Reading those books way back when, it all felt familiar to me. Then I realized why... Adele Faber and Ilene Mazlisch developed out of going to parenting groups in the late sixties and early 70's, with a famous author and doctor (whose name I am forgetting) who wrote Between My Baby and Me. They credit his work and these groups as the formulation for all their books and theories and experience. Well lucky for me, my mother also attended these very same groups in New York City. She will still say that the original book, Between Baby and Me, was the most formative and impactful book she has ever read, and formed the basis of her parenting. So of course the precepts sounded familiar to me. Its exactly how I was raised. So my two stars for this book may not be reflective of its use and application for others - it was that I wanted more, different, deeper for myself. At least one thing that I found was helpful, is that it easily explained the science without complicated jargon, and how it works in day to day parenting. And that is something we can use. The daily application of mind and brain science to actual practical application. I found that useful and important. But not quite revolutionary for me. I really liked this book...It is the first i personally read that is dedicated to explain psychology and physiology of child's brain and i am hoping to find more books like this one. I liked the strategists suggested to deal with children and how to help kids integrate with their mind and with others'. I specially liked that fact the some of the methods and examples presented were illustrated in cartoons. I find this visualization to be important and it makes it easy for parents to remember the t I really liked this book...It is the first i personally read that is dedicated to explain psychology and physiology of child's brain and i am hoping to find more books like this one. I liked the strategists suggested to deal with children and how to help kids integrate with their mind and with others'. I specially liked that fact the some of the methods and examples presented were illustrated in cartoons. I find this visualization to be important and it makes it easy for parents to remember the techniques when needed. It's not just a parenting book: most adults' mental health would benefit from reading this. The overall concept, explored in detail, is that humans are made up of many things and the better we can learn to make them work together, the better it will all work. I am fascinated in particular by how physical activity can change moods and how we can control our thoughts. I’ve been intrigued by a number of books recently that deal with brain development and emotional intelligence in children. This book, written by Daniel J. Siegel, M.D., takes a look at the neurology of various emotional situations and strategies for dealing and developing emotionally intelligent children. As I write this post, I have not finished the book, but what I have enjoyed most so far is that it gives examples of “traditional” (authoritarian) parenting and strategies for managing situation I’ve been intrigued by a number of books recently that deal with brain development and emotional intelligence in children. This book, written by Daniel J. Siegel, M.D., takes a look at the neurology of various emotional situations and strategies for dealing and developing emotionally intelligent children. I felt disappointed in this book. Generally speaking, there weren't new ideas shared or new research. The book read like the authors were trying to explain neuroscience to a young audience or maybe an audience with no exposure to child development. The book focused on anecdotal stories to illustrate why a strategy worked but did not back up claims with research. The one thing I liked was that since the book was so simply written, it gave me ideas about how to explain some concepts about the brai I felt disappointed in this book. Generally speaking, there weren't new ideas shared or new research. The book read like the authors were trying to explain neuroscience to a young audience or maybe an audience with no exposure to child development. The book focused on anecdotal stories to illustrate why a strategy worked but did not back up claims with research. The one thing I liked was that since the book was so simply written, it gave me ideas about how to explain some concepts about the brain's development to my son. If you've taken a human development course or basic psych... skip this book. A fascinating read with good examples of how to transfer strategies to situations with your children. Some paragraphs are a slog to get through but on the while I got a lot out of this book, including many lightbulb moments! This is a great book that explains why children behave the way they do. I, personally, would recommend this to any parent. Read this! Far from long winded yet full of useful information and practical examples. I learned so much and will reference this book often I am sure. I don't see it as a "must read" as a parent. The advice is on par with the other parenting books out there and it will probably help a bit to read it if only to make sure the concepts get cemented into the back of your mind. I hate how it drags a lot, repeats the same points & takes the already flawed "divided brain" metaphor and beats it into the ground. You won't go 3 sentences without seeing the words "left brain, right brain, up brain, down brain, completeness etc". It's tiring, annoying I don't see it as a "must read" as a parent. The advice is on par with the other parenting books out there and it will probably help a bit to read it if only to make sure the concepts get cemented into the back of your mind. I mean. If I can successfully integrate even one idea from this book - I would basically be Oprah. Empowered AF. I also love imagining that the authors’ kids are some Cheeto dust injecting social hermits. Like wouldn’t that be amaze. But this book does seem to have some accessible ideas - imma try it and report back. A great parenting resource that I know I will return to again and again. Daniel J. Siegel, M.D., is an internationally acclaimed author, award-winning educator, and child psychiatrist. Dr. Siegel received his medical degree from Harvard University and completed his postgraduate medical education at UCLA with training in pediatrics and child, adolescent and adult psychiatry. He is currently a clinical professor of psychiatry at the UCLA School of Medicine, where he also Daniel J. Siegel, M.D., is an internationally acclaimed author, award-winning educator, and child psychiatrist. Dr. Siegel received his medical degree from Harvard University and completed his postgraduate medical education at UCLA with training in pediatrics and child, adolescent and adult psychiatry. He is currently a clinical professor of psychiatry at the UCLA School of Medicine, where he also serves as a co-investigator at the Center for Culture, Brain, and Development, and is a founding co-director of the Mindful Awareness Research Center. In addition, Dr. Siegel is the Executive Director of the Mindsight Institute. Dr. Siegel has the unique ability to convey complicated scientific concepts in a concise and comprehensible way that all readers can enjoy. He has become known for his research in Interpersonal Neurobiology – an interdisciplinary view that creates a framework for the understanding of our subjective and interpersonal lives. In his most recent works, Dr. Siegel explores how mindfulness practices can aid the process of interpersonal and intrapersonal attunement, leading to personal growth and well-being. Published author of several highly acclaimed works, Dr. Siegel’s books include the New York Times’ bestseller “Brainstorm”, along with "Mindsight," "The Developing Mind," "The Mindful Brain," "The Mindful Therapist," in addition to co-authoring "Parenting From the Inside Out," with Mary Hartzell and "The Whole-Brain Child," with Tina Bryson. He is also the Founding Editor of the Norton Professional Series on Interpersonal Neurobiology, which includes "Healing Trauma," "The Power of Emotion," and "Trauma and the Body." Dr. Siegel currently lives in Los Angeles with his wife. For more information on Dr. Siegel's work, please visit DrDanSiegel.com.